I wake up to my mom yelling at me to get up. "Samantha Pineblanket! Get up or you're gonna be late!" I grumbled and slid out of my comfy bed. Why did I have to go to Jorvik? Why? My parents were going on a vacation to Hawaii -- WITHOUT ME!!! I couldn't believe it. I stumble over to the bathroom and look at myself. My blonde hair with brown at the tips was all over the place! I grab a brush and work my way through it and when I'm done I put it in a ponytail with a braid. My fave casual hairstyle. I go back to my room and get dressed. I put on a double Dutch tank top from Ivivva, my favourite store. Then I put on my leggings and my lucky necklace that was a silver figure skate. Skating was my life. I loved doing it and am in an elite academy. When I went to Jorvik, I would have to ride a HORSE! I'm scared of them since one bit me when I was at a stable with my parents. I grab my pink suitcase and haul it downstairs. My dad is drinking coffee while reading the newspaper in our kitchen at the table. My mom is on her phone probably texting her friends about their wonderful vacation with no kids. I grab a chocolate chip muffin and she looks up from her phone. "Morning, Hun," she says. I frown. "Morning." My dad also looks up from his newspaper. "Oh, good morning, Samantha," he says and goes back to his paper. I don't reply. Mom checks the time on her silver watch. "We better go or we"ll be late." I groan. "Why can't I go to Hawaii with you?!" Mom frowns, "you know why, Samantha. Your dad and I need a break from work," she replies sternly. I sigh and follow them outside to the truck. The summer breeze flows around me and I sigh breathing in the air. "Nice, isn't it?" My dad tells me. "Yeah, totally." I answer sarcastically. When we get to Moorland, there are lots of people riding horses and I shudder at the thought of me having to ride one. My mom and dad hug me and get into the truck. "Have a nice time Samantha!" They wave and drive off. I wander into Moorland Stables aimlessly and run into a boy my age who has black hair and blue eyes. "Oh sorry," I apologize nervously. "No, it's okay," he replies and smiles. "You must be the new girl," he says and we shake hands. "I'm Justin and you are?" He asks. "I'm Samantha." I say nervously. "Well, go to the stables and the stable girl May will be there," he explains and waves to me. I wave back. "Wow, Samantha, great job." I think. I follow the directions Justin gave me and find a cheerful red-haired girl with a pitch fork scooping up dirty straw. I tap on her shoulder and she looks up to me, wiping the sweat off her forehead. "Oh I didn't see you there! Howdy, I'm May!" She introduces herself cheerfully. "Um, hi." I answer and she holds out her hand. No way am I going to shake her dirty, sweaty hand! I hide my hands behind my back and she drops her hand. "That's alright, I am mighty dirty," she says and smiles. "Now, let me show you your horse," she says and points to a beautiful tan-coloured horse. "That's Foxy, your mare." "Umm, what's a mare?" I ask and she laughs. "A grown up female horse." She leads me over to her and hands me a carrot. I shudder. "Umm, no thanks. You can feed her." "Well, alright!" She holds her hand out flat and Foxy gently takes the carrot and munches on it. She nudges my arm and I shrink back. "No need to be afraid," May gently says. "Foxy is gentle as can be but she's very fast and a good jumper," she explains and adds, "she's a Morgan." I'm puzzled and May must have seen the look on my face and she chuckled again. "A Morgan is a breed of horse." After May "tacks up" Foxy, she shows me how to steer and how to make the horse stop and go. I warm up to Foxy and realize she won't hurt me. I pat her neck and ride to Jenna, the other stable girl. "Hi Samantha," she says. "Hi." I answer and she tells me that if I'm an okay enough rider to let out of the gates then I'll accomplish the cavalletis. I canter over the poles partly nervous and pull back on the reins in front of Jenna. "Perfect!" She comments and I smile. "Thanks Jenna." "Now, you can go to Loretta the leader of the Bobcat Girls. She is very nice and will give you some tips." "Okay," I answer and follow Jenna"s instructions and come to a blonde pretty girl and right away I can tell she's actually a snob. "Hi, you must be Loretta," I say and she frowns at me. "Who are you?" "I'm Samantha," I say. "Samantha? Wow, what a name." She answers sarcastically. "Your horse's name must be just as worse, like puffy heart or something?" If you see, please read my story, it is called Midnight the Black Stallion. That story is really good. Please write more!!!!! Keep up the good work!!! Cool! I look forward to it. Anyway, I wrote a Star Stable story myself-- but it's not quite done yet, it called: The Star Stable Mysteries. Have you heard of it? I love it! 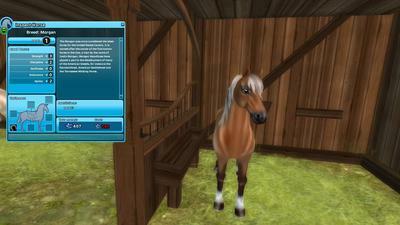 Another Star Stable adventure story! Oh, and another thing: would you like to be friends on Star Stable? If you would my avatar name on there is: Annabelle Mysteryknight. love it! Keep writing, plz! Definitely! I love it! Love the touch of romance! Keep going! You could say, "exclaimed", "sighed", "huffed" or "I snap", or "s/he snapped". Er.. that's all I can think of! Can you read my story - Aroura, the Appaloosa? Thanks!